(Newser) – It's bad enough to be detained for a crime you didn't commit; it's worse when that detention leads to nearly three weeks in the back of a van, deprived of a bathroom. The Washington Post reports a Virginia man is suing for just that, saying he was arrested in September 2016 in Winchester, Va., with a cop telling him the car he was driving had been reported stolen in Houston. 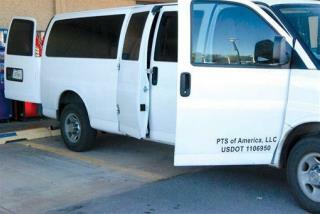 He was then extradited to Texas in an 18-day trip in a private prison transport van. Edward Kovari's suit—filed against Brevard Extraditions, Prisoner Transportation Services of America, and its parent company, Prisoner Transportation Services—says he and the 15 or so others crammed in the van received small water rations and occasional fast food, that he was denied his hypertension meds, and that, due to no bathroom breaks, he spent much of the seven-state trip sitting in his own and others' waste. Damn! Why didn't he just get out and use the bathroom, then return where he was??!!! I really don't understand people that much!!! If you need to go, you NEED to go!!! When the man asked for his medication after his blood pressure reached a deadly level, the cops barked, "Shut up or we'll tase you." He was innocent. This could happen to any one of us.